Vortices behind a spoon dragged through coffee. Dragging a spoon through coffee (or tea) has got to remain one of the easiest ways to see, and play with, vortices. Changing the way that you pull the spoon through the coffee, you can make the vortices travel at different speeds and watch as they bounce off the sides of the cup. 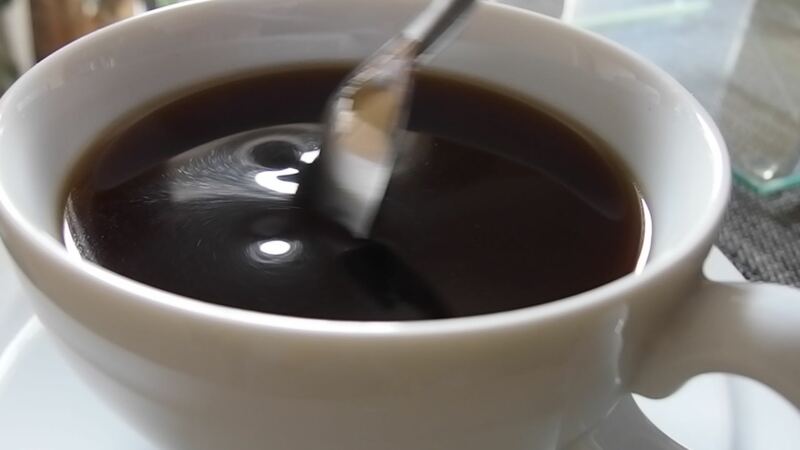 This type of vortex can be seen whenever one object (such as the spoon) pulls through a fluid (such as the coffee). Examples could be the whirlwinds behind buses (and trains), the whirlpools around the pillars of bridges in rivers and the high winds around chimneys that has led some chimneys to collapse. Yet there is another type of vortex that you can make, and play with, in coffee. A type of vortex that has been associated with the legends of sailors, supernovae and atomic theory. 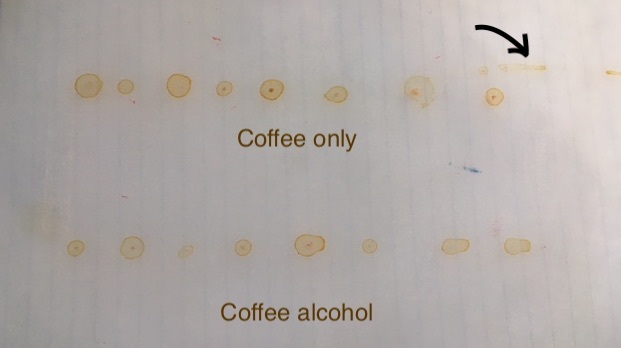 If you add milk to your coffee, you may have been making these vortices each time you prepare your brew and yet, perhaps you’ve never noticed them. They are the vortex rings. Unlike the vortices behind a spoon, to see these vortex rings we do not pull one object through another one. 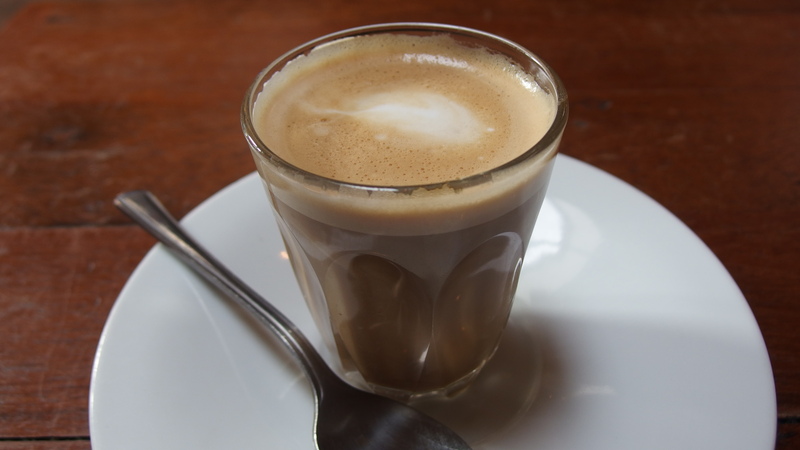 Instead we push one fluid (such as milk) through another fluid (the coffee). It is said that there used to be a sailor’s legend: If it was slightly choppy out at sea, the waves could be calmed by a rain shower. One person who heard this legend and decided to investigate whether there was any substance to it was Osborne Reynolds (1842-1912). Loading a tank with water and then floating a layer of dyed water on top of that, he dripped water into the tank and watched as the coloured fluid curled up in on itself forming doughnut shapes that then sank through the tank. The dripping water was creating vortex rings as it entered the tank. 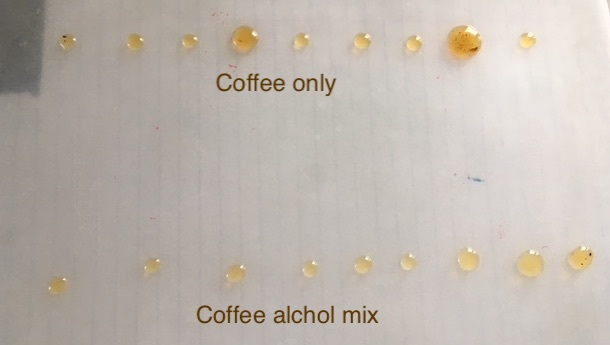 You can replicate his experiment in your cup of coffee, though it is easier to see it in a glass of water, (see the video below for a how-to). Reynolds reasoned that the vortices took energy out of the waves on the surface of the water and so in that way calmed the choppy waves. As with Benjamin Franklin’s oil on water experiment, it’s another instance where a sailor’s myth led to an experimental discovery. In high winds, vortices around chimneys can cause them to collapse. 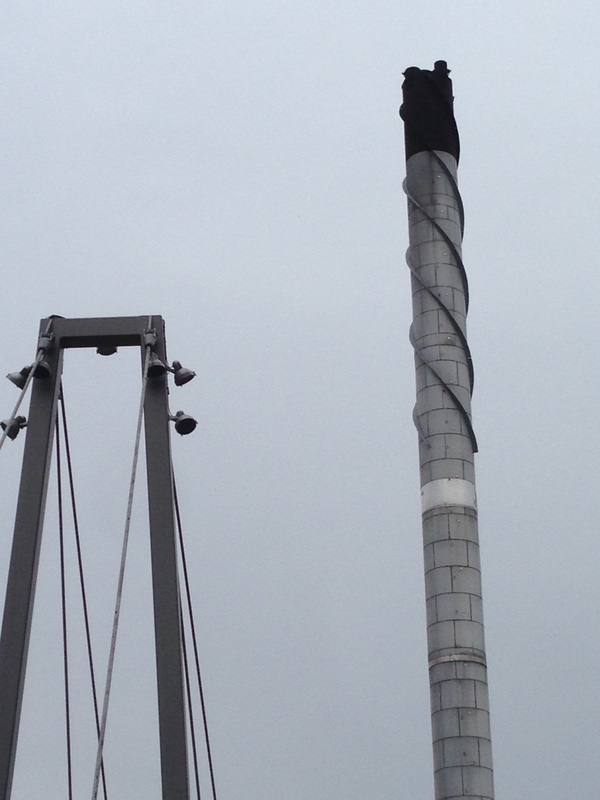 The spiral around the chimney helps to reduce these problem vortices. Another physicist was interested in these vortex rings for an entirely different reason. William Thomson, better known as Lord Kelvin, proposed an early model of atoms that explained certain aspects of the developing field of atomic spectroscopy. Different elements were known to absorb (or emit) light at different frequencies (or equivalently energies). These energies acted as a ‘fingerprint’ that could be used to identify the elements. Indeed, helium, which was until that point unknown on Earth, was discovered by measuring the light emission from the Sun (Helios) and noting an unusual set of emission frequencies. Kelvin proposed that the elements behaved this way as each element was formed of atoms which were actually vortex rings in the ether. Different elements were made by different arrangements of vortex ring, perhaps two tied together or even three interlocking rings. The simplest atom may be merely a ring, a different element may have atoms made of figure of eights or of linked vortex rings. For more about Kelvin’s vortex atom theory click here. Kelvin’s atomic theory fell by the way side but not before it contributed to ideas on the mathematics (and physics) of knots. And lest it be thought that this is just an interesting bit of physics history, the idea has had a bit of a resurgence recently. It has been proposed that peculiar magnetic structures that can be found in some materials (and which show potential as data storage devices), may work through being knotted in the same sort of vortex rings that Kelvin proposed and that Reynolds saw. And that you can find in a cup of coffee, if you just add milk. V60 bubbles. There is much to be gained by slowing down while brewing your coffee. Preparing a coffee with a pour-over brewer such as a V60 is a fantastic way to slow down and appreciate the moment. 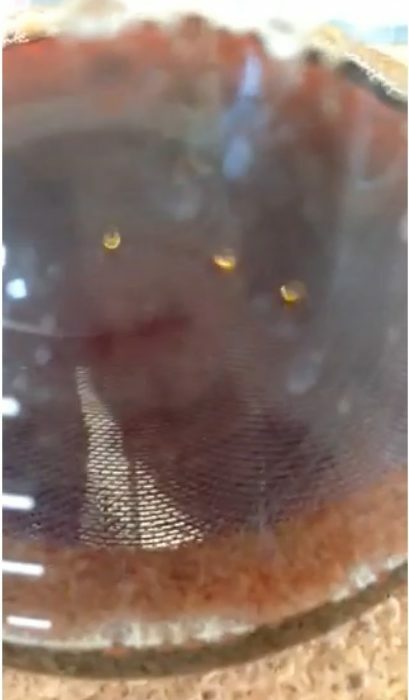 Watching anti-bubbles dance across the surface as the coffee drips through, inhaling the aroma, hearing the water hit the grind and bloom; a perfect brewing method for appreciating both the coffee and the connectedness of our world. 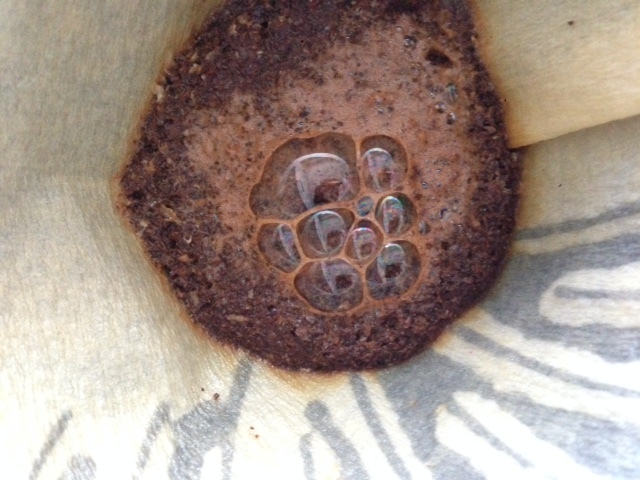 The other week, while brewing a delightful Mexican coffee from Roasting House¹, I noticed something somewhat odd in the V60. Having placed it on the kitchen scales and, following brewing advice, measured the amount of coffee, I poured the first water for the bloom and then slowly started dripping the coffee through. Nothing unusual so far and plenty of opportunity to inhale the moment. But then, as I poured the water through the grind, I noticed the scales losing mass. As 100g of water had gone through, so the scales decreased to 99g then 98g and so on. It appeared the scales were recording the water’s evaporation. Bubbles of liquid dancing on the surface of a brewing coffee. Was it possible that somehow Halley’s demonstration of some three hundred years ago was being replicated on my kitchen scales? Halley had measured a pan of water heated to the “heat of summer” (which is itself thought provoking because it shows just how recent our development of thermometers has been). The pan was placed on one side of a balance while weights were removed on the other side to compensate the mass lost by the evaporating water. Over the course of 2 hours, the society observed 233 grains of water evaporate, which works out to be 15g (15 ml) of water over 2 hours. 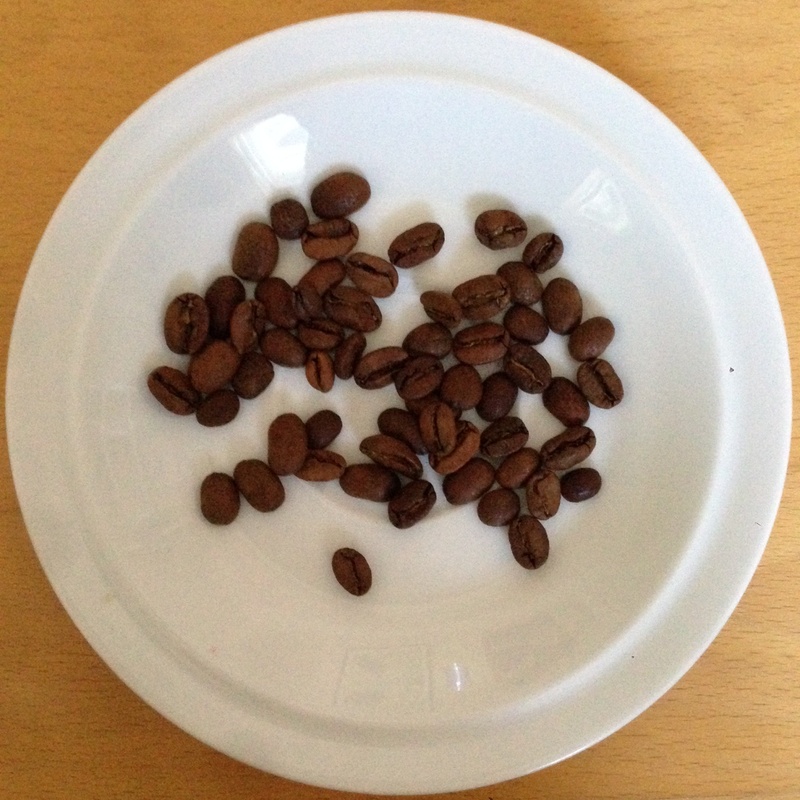 How did the V60 compare? Rather than waste coffee, I repeated this with freshly boiled water poured straight into the V60 that was placed on the scales. In keeping with it being 2017 rather than 1690, the scales I used were, not a balance, but an electronic set of kitchen scales from Salter. The first experiment combined Halley’s demonstration with my observation while brewing the Mexican coffee a couple of weeks back. The V60 was placed directly on the scales and 402g of water just off the boil was poured into it. You can see what happened in the graph below. Within 15 seconds, 2 g had evaporated. It took just a minute for the 15g of water that Halley lost over 2 hours (with water at approximately 30 C) to be lost in the V60. After six minutes the rate that the mass was being lost slowed considerably. 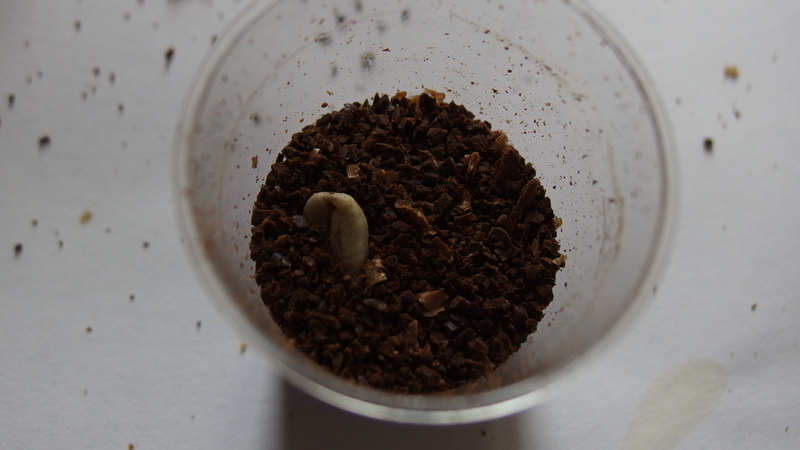 The total amount lost over 12 minutes had been 70g (70ml). 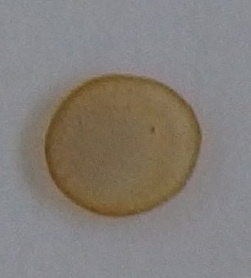 A V60 filled with 400g of water just off the boil seemed to evaporate quite quickly when placed directly on the scales. Of course, you may be asking, could it be that the scales were dodgy? 70g does seem quite a large amount and perhaps the weight indicated by the scales drifted over the course of 12 minutes. So the experiment could be repeated with room temperature water. Indeed there did appear to be a drift on the scales, but it seemed that the room temperature water got moderately heavier rather than significantly lighter. A problem with the scales perhaps but not one that explains the quantity of water that seems to have evaporated from the V60. 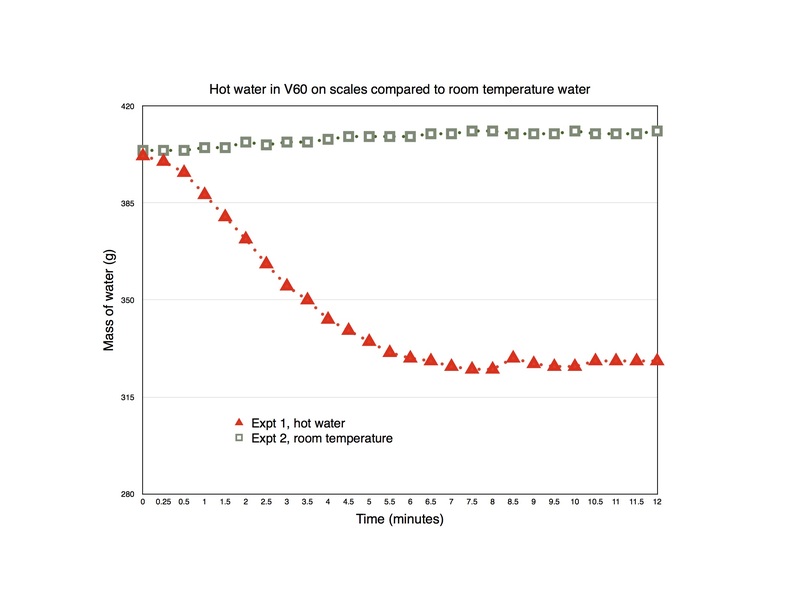 Hot water (red triangles) loses more mass than room temperature water (grey squares). Could the 70g be real? 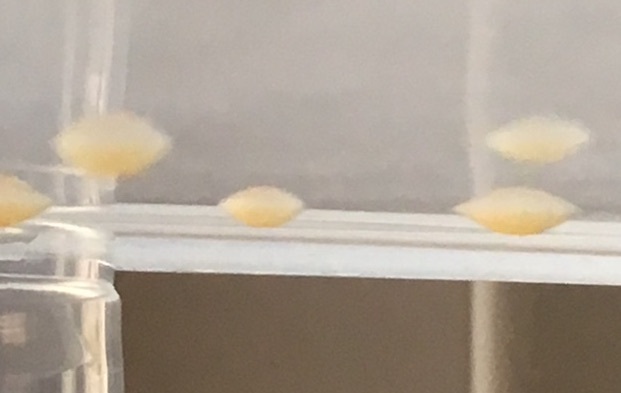 Well, it was worth doing a couple more experiments before forming any definite conclusions. 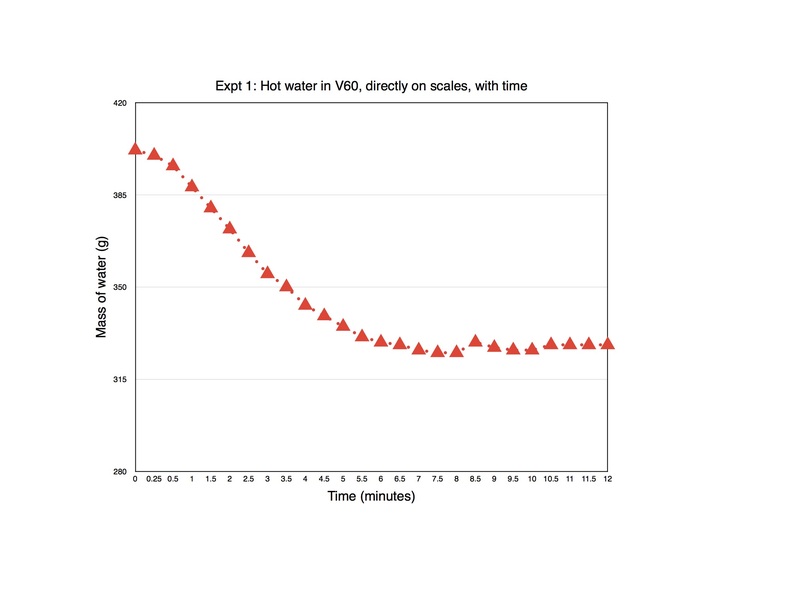 Could it be that the heat from the V60 was affecting the mass measured by the electronic scales? After all, the V60 had been placed directly on the measuring surface, perhaps the electronics were warming up and giving erroneous readings. The graph below shows the experiment repeated several times. 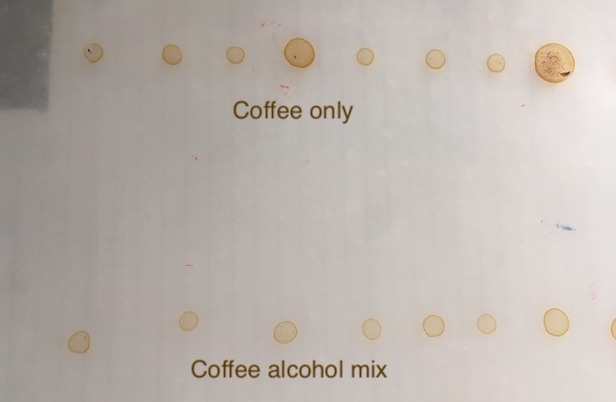 In addition to the two previous experiments (V60 with hot water and V60 with room temperature water placed directly on the scales), the experiment was repeated three more times. Firstly the V60 was placed on a heat proof mat and then onto the scales and filled with 400g of water. Then the same thing but rather than on 1 heat proof mat, three were placed between the kitchen scales and the V60. This latter experiment was then repeated exactly to check reproducibility (experiment 4). You can see that the apparent loss of water when the V60 was separated from direct contact with the scales was much reduced. But that three heat proof mats were needed to ensure that the scales did not warm up during the 12 minutes of measurement. Over 12 minutes, on three heat proof mats, 14g of water was lost in the first experiment and 17g in the repeat. 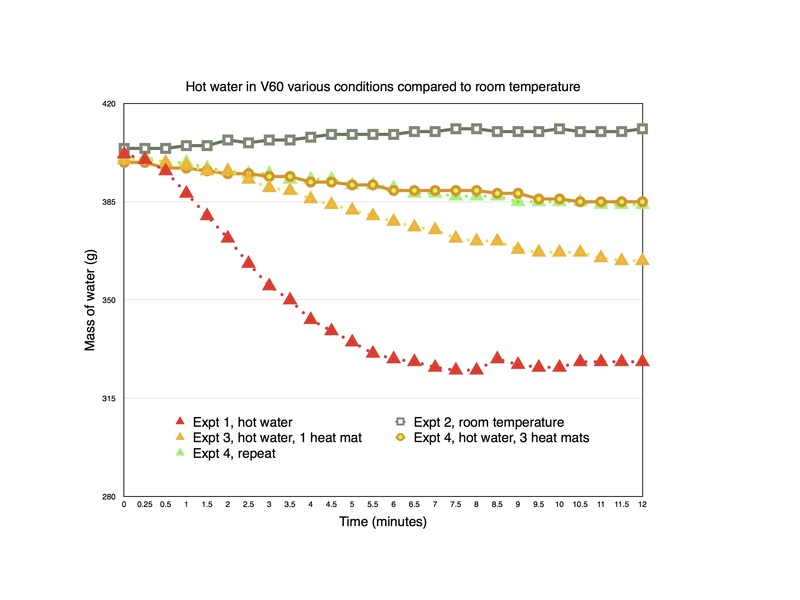 This would seem a more reasonable value for the expected loss of water through evaporation out of the V60 (though to get an accurate value, we would need to account for, and quantify the reproducibility of, the drift on the scales). The full set: How much water was really lost through evaporation? Halley went on to estimate the flow of water into the Mediterranean Sea (which he did by estimating the flow of the Thames and making a few ‘back of the envelope’ assumptions) and so calculate whether the amount of water that he observed evaporating from his pan of water at “heat of summer” was balanced by the water entering the sea from the rivers. He went on to make valuable contributions to our knowledge of the water cycle. 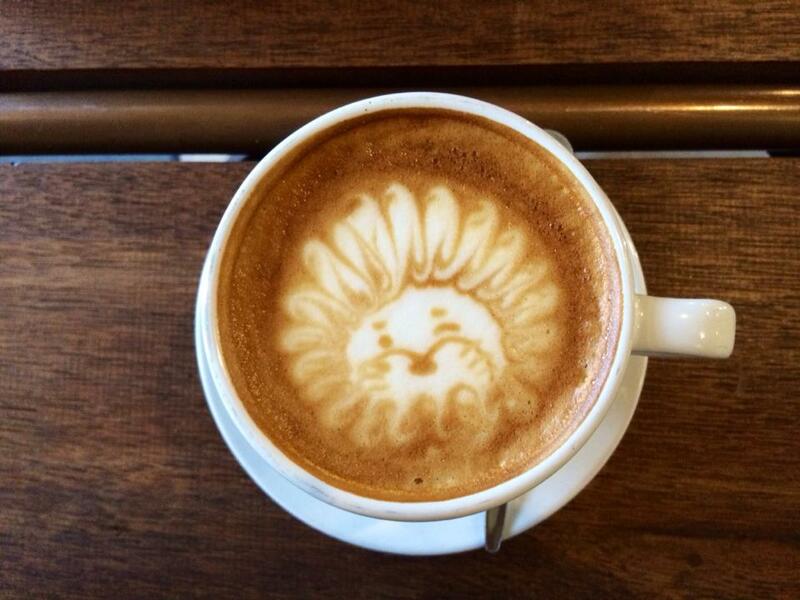 Could you do the same thing while waiting for your coffee to brew? Let me know your results, guesses and thoughts in the comments section below (or on Twitter or Facebook). ¹As this was written during Plastic Free July 2017, I’d just like to take the opportunity to point out that Roasting House use no plastic in their coffee packaging and are offering a 10% discount on coffees ordered during July as part of a Plastic Free July promotion, more details are here.